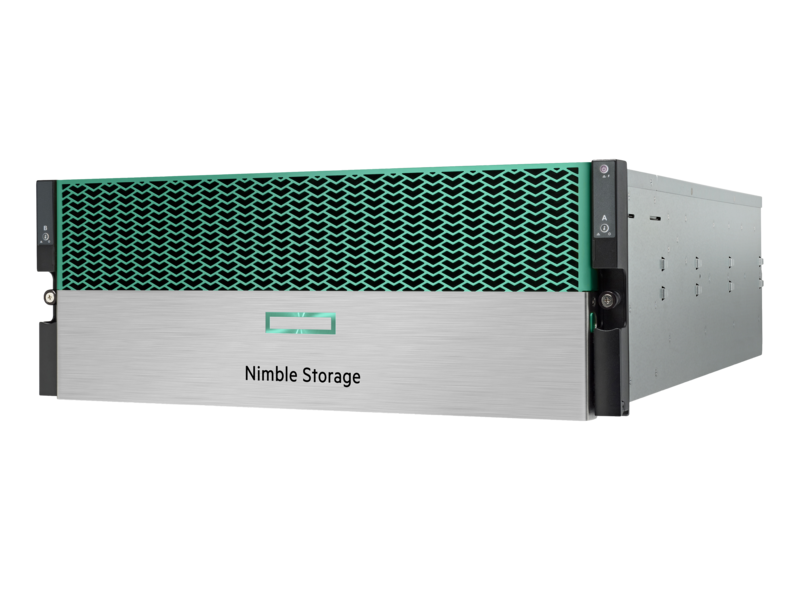 The Nimble Secondary Flash Array represents a new type of data storage optimized for both Capacity and Performance. It adds high performance flash storage to a capacity-optimized storage architecture for a unique backup platform that lets you put your backup data to work. The Nimble Secondary Flash Array is Cloud Ready and optimized for backup, disaster recovery and secondary data storage. By using Flash, it lets you put your backup data to work for Dev/Test, QA and analytics. Instantly backup and recover data from any primary storage system. With our integration with leading backup software, it simplifies data lifecycle management and provides a path to cloud archiving. The Flash-enabled architecture delivers fast backup and restores, and doesn’t compromise on storage efficiency. Flash also provides the speed to let you quickly test and verify backups as you go, providing peace of mind. With secondary flash, you can quickly access files, VMs, applications or entire systems, or rapidly copy them back to primary. Or, don’t wait to restore: run production workloads at full speed on the Secondary Flash array and restore in parallel. The Secondary Flash array is Capacity-optimized to reduce your cost per gigabyte – delivered in part through Flash-enabled inline data reduction up to 18:1 or more, with no performance impact. Run real workloads with flash performance, such as Dev/Test, QA, Patch testing, Reporting and Analytics. Zero-copy clones let you re-use backup data and instantly spin up hundreds of application copies. The Secondary Flash array lets you easily and quickly get to your data: reads are over 100x faster than with traditional hard-drive-based backup appliances. Restores can be near-instantaneous, or you can just run your application directly from the array for performance similar to Primary storage. For Nimble environments, execute thousands of instant, zeroimpact snapshots on primary storage and natively replicate to the Secondary Flash Array. All Nimble flash arrays are Cloud Ready — providing an easy on-ramp to the cloud through Nimble Cloud Volumes. 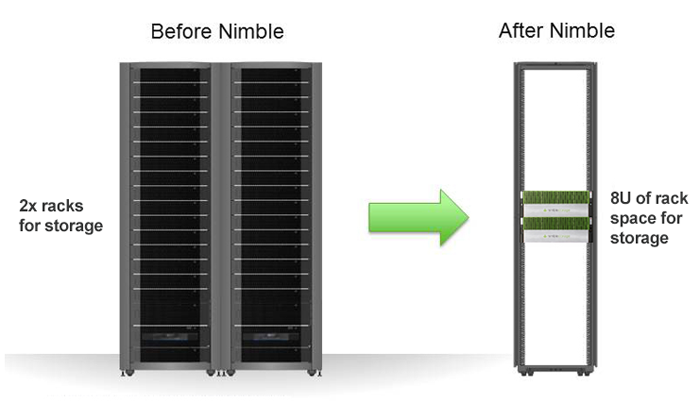 The new Nimble Secondary Flash Array was built on the same innovative data management platform as the AF and CS-Series arrays. With this comes the extensive instrumentation and cloudbased intelligence comprising the industry-leading Internet of Things capability, Infosight. With InfoSight Predictive Analytics, the Secondary Flash Array, along with your entire Multicloud Flash Fabric, is automatically monitored. On-demand status and performance insights are available at a click of a button, as well as trend analysis to help plan for future infrastructure needs. InfoSight predicts and prevents 9 out of 10 problems, and has visibility across the application-to-storage stack, achieving 99.9999% uptime across the HPE Nimble Storage customer base. The SF Series is a line of storage arrays optimized for Secondary storage tasks, optimized for data deduplication to maximize effective capacity. Initial models available are the SF100 and the SF300. Both are comparable in terms of array-based Snapshots, Replication and Cloning capabilities, always-on inline data reduction, and cost-effective data capacity. The SF100 is the initial entrylevel model, targeted at midsize IT organizations or Disaster Recovery sites of larger organizations. The SF300 was designed for larger organizations and provides twice the capacity, IOPS and throughput of the SF100. No more backup windows. Zero impact to host. InfoSight Predictive Analytics anticipates and prevents issues for trouble-free operations, and greater than 99.9999% measured availability. Nimble arrays come with a satisfaction guarantee, all-inclusive software licensing, flat support pricing, and no forklift upgrades. Deep integration with Veeam and other data-protection software simplifies the data management lifecycle. For Nimble environments, easily manage both Primary and Secondary storage arrays within a single Multicloud Flash Fabric. Execute thousands of zero-impact snapshots on Primary storage and natively replicate to the Secondary Flash array. 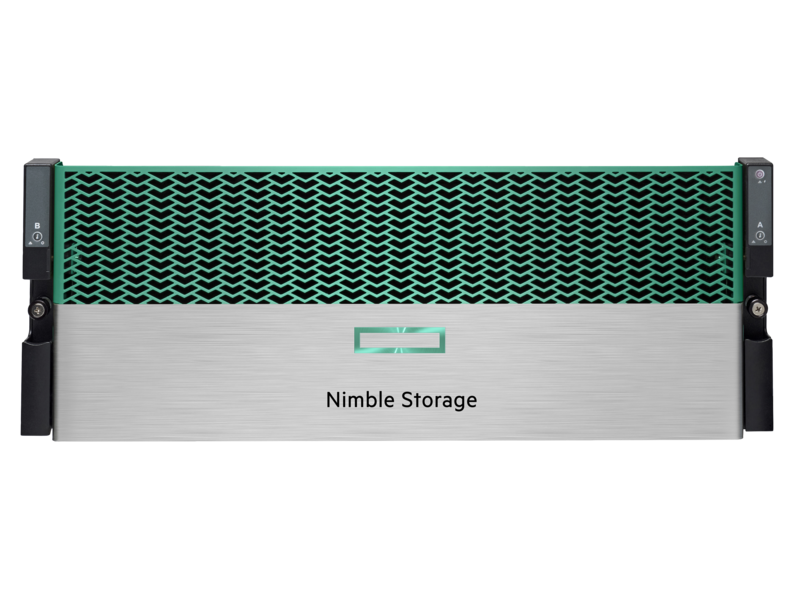 Download HPE Nimble Storage Secondary Flash Array Datasheet (PDF). 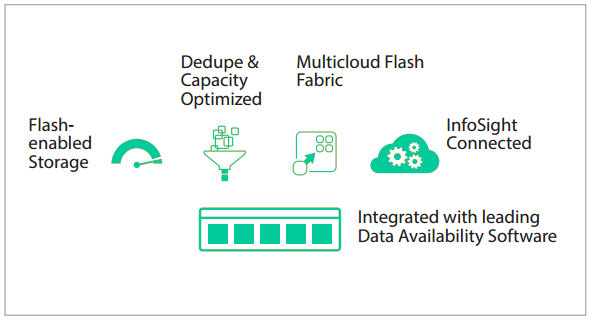 Download HPE Nimble Storage Secondary Flash with Veeam Software Brief Datasheet (PDF).